GRAFENWOEHR, Germany — Summer is around the corner and kids across USAG Bavaria are excited for school to end. Parents, on the other hand, might not be so excited for summer to start. As a parent (and key entertainer), you might be wondering how you are going to avoid the dreaded phrase “I’m bored” from your child. Parents, don’t panic. How about exploring the great outdoors? Here are some great ideas for free or cheap summer fun. As a plus, these activities invoke learning and exploration. They are all about being outside and exploring all that nature has to offer. Don’t know where to go? With the right activity, your backyard can be more fascinating than you think. Or, there are numerous nature opportunities on post, such as the Environmental Trail at the Wild B.O.A.R. Outdoor Recreation Center on Tower Barracks, the Green Outdoor Classroom next to the commissary on Rose Barracks, the area around Big Mike Lake on Rose Barracks or the Green Classroom Trail next to Friendship Lodge located above the Festplatz on Hohenfels Military Community. In order to better enjoy your outdoor adventure, learn to identify common nettle so you do not have an interaction with this self-protecting plant – it is not poisonous but touching it can cause an itchy, uncomfortable rash. After your day of outdoor fun, be sure to check for ticks. Turn an ordinary walk into a fun nature scavenger hunt! Teach your children about the colors of the rainbow by having them find an object in nature that matches each color. Or turn your scavenger hunt into a complete sensory experience by focusing on the senses. Challenge them to find and touch a smooth object, or find and smell a flower with a sweet scent. For cool ideas on how to organize your scavenger hunt, visit nature scavenger hunt or no time for flash cards. Toss aside those paint brushes and crayons. This form of art needs no conventional art supplies. What it does require is an eye for natural beauty, some creative vision and the bounty of the outdoor world. Think sticks and leaves are boring? Try arranging them in a beautiful spiral pattern or in the shape of a dragonfly. Pretty cool, huh? This is what land art is all about: using natural items to create unique works of art. So head outside and get creative! Read land artist Richard Shilling’s interview about what land art is and why he loves it. Need more ideas to get started? Check out how to create land art jump-starter. Teach your children about the wonders of birds and the science of flight by making a bird feeder. These bird feeders are made from items found around the house or outside, so there is no need to get out the hammer. Hang your feeder on a tree branch or pole and observe it each day. Check out a bird book from the Hohenfels, Garmisch, Tower Barracks or Rose Barracks libraries and explore the many different species of birds in Germany. For information on local German bird species, check out German archive. Learn more about how to build your own bird feeder here. Move aside traditional paint brushes. Here is an activity that gets you painting with nature. Take your kids on a walk or explore the backyard for things such as leaves, grass, sticks and flowers. Collect a few, dip them into paint and use them as paintbrushes and stamps. Let your child’s creativity open up and run wild. For instructions and ideas on how to create your backyard nature paintings, check out backyard painting with nature. “I love insects” said no one ever. Well, except for a few of us bug-loving, crazy people. When you start to think about the form and function of each insect, they are actually pretty cool. 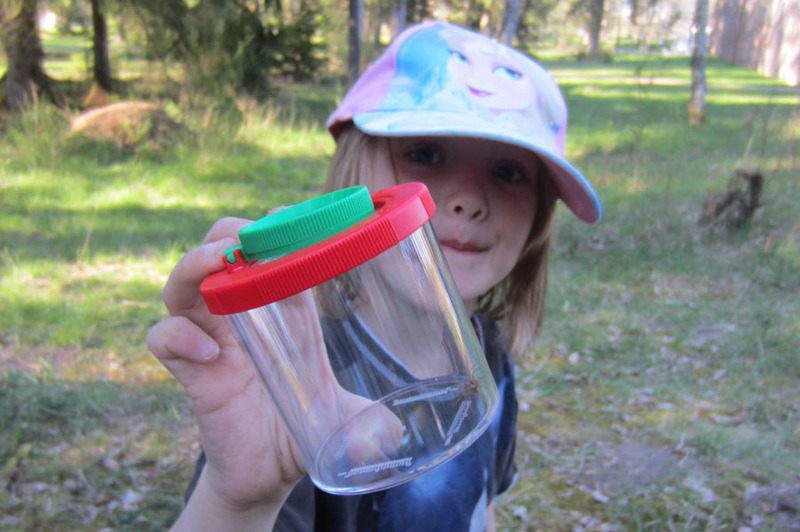 Talk to your kids about the wonders of the insect world and take them on a bug hunt. This is a great opportunity to use those counting and observing skills. Don’t want to collect any bugs? No worries, this activity can be done solely through observation. Before going, discuss the importance of respecting all life. Put a bug’s life into perspective for your children by letting them know people are GIANTS in comparison to these tiny creatures. Insects should not be squashed and should be returned unharmed to their original location. Also, make it known that some insects protect themselves by biting or stinging. Use caution when picking up any insects that you find. For more information and ideas on creating your own bug hunt, check out find and count bug hunt. This is another one of those artsy but science-filled craft activities. You can make beautiful summer banners by pounding leaves and flowers onto white fabric. This is an opportunity to talk about colors and color pigments. The link below explains pigment molecules in an easy way. Head into your yard or go on a walk to find vibrantly colored leaves and flowers, then head home to get creative. Learn more about how to make these banners here. This activity can be done in a cup or in a large garden plot. Don’t have a yard? One of Rose and Tower Barrack’s best kept secrets are the garden plots you can rent from Self Help. Go to your nearest Self Help office to talk about availability. Overwhelmed by the idea of maintaining a large garden? Keep it small. Plant a few seeds in a cup of soil, add water and sunlight, and watch your seeds grow! The daily checking and watering of a garden, no matter how big or small, is a fun activity for the whole family. You can get creative by measuring and recording plant growth, keep an observation journal of writings and drawings as your flowers grow or veggies develop, cook a meal made from things in your garden or use the opportunity to talk about sharing by giving a portion of your bounty to a neighbor. Gardening has many life lessons to teach. For information about gardening with children, visit gardening with children. For information on gardening basics, visit planning your first vegetable garden.